SUBHEAD: Nature was hobbled and tripped, chewed up and carted away … gone in the blink of a geologic instant. 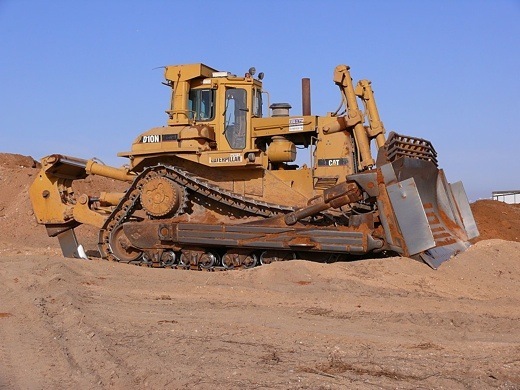 Image above: A Catepillar D10 bulldozer on a patch of bare Earth. From (http://www.resilience.org/stories/2018-04-02/the-wreckage-we-leave-a-memorial-for-that-which-is-no-more/). A memorial to that which is no more. The hawk floats in over the valley with eyes sharply focused for any movement. It’s a ritual performed more out of habit than hoped-for consequence, above this once-teeming feeding ground that is no longer. How does the raptor fathom a clear-cut and soil-stripped landscape? The accipiter’s ancestors have hunted this very ridge and creek for tens of millions of years, but it is now forced to move on by an interloper on a bulldozer. With wings thus clipped, it spirals out of sight and into the past. Who gave us the right? Where there were turtles, snakes, foxes, opossums, raccoons; nests with birds of every manner, from titmice to owls; groundhogs, deer, skunks, even kids who waded and swam in the water — they are gone now. Where there was topsoil, rich with earthworms and nutrients, and assorted species of insect and mammalian life — they are gone. Where there was any life in the creek winding through this valley that depended on a healthy ecosystem above its banks, it is gone. Trees? Gone. Loam, clay, and rock? Gone. A ridge called by any familiar name? It too is now gone. Ownership. A quaint term for destruction. That such a right should be asserted by a creature whose lifespan is a mere four-score years, over a wedge of land and ridge formed three-hundred million years in the past — a claim of judge, jury, and executioner for this province nestled between the Cumberland Plateau and the Appalachian Mountains — is pure hubris. Able to survive and prosper through four million, sixty-two thousand, five hundred lifespans of one single human, this valley, this self-sustaining microcosm, was unable to outlast the machine. It was hobbled and tripped, chewed up and carted away … gone in the blink of a geologic instant. This right, this wreckage, we leave behind.